LOGAN, Utah – Campbell Scientific announces a new version of their weather station software, VisualWeather 3.0. 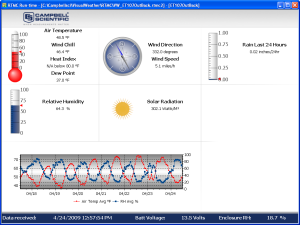 VisualWeather provides software support for various Campbell Scientific weather stations, including the ET107, ET106, and MetData1 preconfigured weather stations, as well as custom weather stations. The software allows you to set up the station, interrogate the station, display data, and generate reports from one or more weather stations. VisualWeather 3.0 integrates many enhancements from the previous version. These include support for the ET107 and Toro T107, enhanced station-status and station-data screens, as well as improved web output and FTP support. Changes have been made to the underlying database to allow faster report generation. VisualWeather now includes a global-units option, which controls output units for reports and station data screens, and it can now display the user interface component text in an alternate language if a separate VisualWeather language package has been installed. A fully functional, 30-day trial version of VisualWeather is available, at no charge, from the Downloads section at www.campbellsci.com/visualweather.